The ground breaking of 114 Mount Auburn St. and the redevelopment of the Conductor’s Building in Cambridge, Mass., is set for Wednesday, Feb. 19, at 9:30 a.m. Courtesy of Elkus Manfredi. 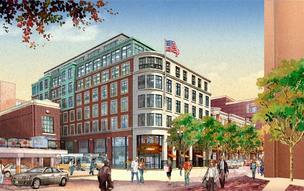 An artist rendering of 114 Mount Auburn St. in Cambridge, Mass. In 2012, Carpenter & Co. bought the Cambridge property to take control of the whole block adjacent to the Charles Hotel it owns. The hotel developer purchased 114-116 Mount Auburn St. in Harvard Square from the Bulfinch Cos. of Newton for $4 million with plans for a major renovation of the historic Conductors Building. A second adjacent parcel was purchased from MBTA in 2007 for $3.2 million in a public bid process. The developer, Richard Friedman, President and CEO of Carpenter Co., plans to build an eight-story, 70,000-square-foot building that will include a restaurant, retail and office space. The $65 million development will include a new main building that is 100 percent leased to Harvard University on a long-term lease. Occupancy is expected to commence next year. The 5,000-square-foot Conductor’s Building historic renovation will happen simultaneously. Friedman, who is well-known for the redevelopment of the former Charles Street Jail into theLiberty Hotel, is taking on another complex public-private partnership in the redevelopment of the century old Conductor’s Building, one of the oldest original structures of the Red Line. The new building is the result of a complex design where the building cantilevers over and above the electric transformers that power the Red Line. The project is expected to revitalize what has been a major eyesore and put to productive use an excess MBTA property and beautify a section of Harvard Square. David Manfredi of Elkus Manfredi of Boston is the architect and the general contractor is Boston-based Tishman Construction.